The boys gymnastics program focuses on building strength, flexibility and confidence in each athlete as they master the skills at each level. Gymnastics teaches important life skills of self discipline in boys as they have to truly focus on each skill and event to be successful, and provides a good base for any sport that the child may pursue later on. Boys ages 5 and up will learn the sport in a positive atmosphere while having fun challenging themselves to new heights. Your child will be introduced to the basics and safety rules of gymnastics on all apparatus. We have a curriculum set for each level that will teach the boys skills on each event before they can progress to the next level. Please speak with a staff member to determine the level that would be most appropriate for your child. We do offer a FREE trial class to evaluate your son's abilities to ensure he is placed in the correct class. 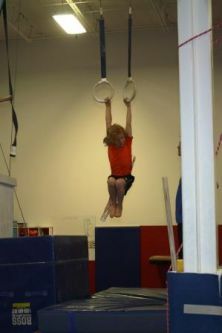 RED - "BEGINNER" - 55 minute class - This class is designed for students with little or no experience in gymnastics. WHITE - "ADVANCED BEGINNER" - 55 minute class - By recommendation only, the gymnast must have completed all core Red level skills before advancing to this level. BLUE - "INTERMEDIATE" - 55 Minute class - By recommedation only, the gymnast must have completed all core White level skills before advancing to this level.